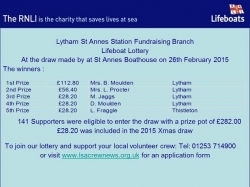 The February draw of the Lytham St Annes Lifeboat Lottery took place prior to our planned afloat exercise on Thursday 26th of February at 18:00 hrs, under the watchful eye of all crew present. If I hadn't seen it with my own eyes I wouldn't have believed it ! All but one of the 5 winners was either a member or a family member of our crew ! Including the Coxswain and a husband and wife !!! When we look a little bit deeper it is easy to see why such a high percentage of the winners have a crew connection. Quite simply the draw is limited to 250 members, and we currently have around 100 vacancies, and the vast majority of the 150 eligible members are crew and their families.